Located 6.8 miles from the Jardim Oceânico metro station and 19.9 miles from the Santos Dumont Airport, the ibis RJ Parque Olímpico offers modern and comprehensive facilities for the comfort and well-being of your family, featuring rooms with an extra bed for a child of up to the age of 12, A/C, free WIFI, a restaurant, bar and parking. Kick-start your day with our freshly prepared breakfast, then enjoy our 24-hour bar and sample regional cuisine in our Kitchen Pasta & Grill restaurant. The ibis RJ Parque Olímpico is located 1.2 miles (2 km) from the Olympic Park, which hosts major events like Rock in Rio and sports events. Make sure you check out the Metropolitano shopping center located opposite the hotel. Avenida Olegário Maciel, located 8.1 miles (13 km) from the hotel, is the perfect place to sample local cuisine and enjoy the delicacies offered by bars and restaurants during your stay in Rio de Janeiro. Modern and inviting, the new ibis room has everything you need: a comfortable bathroom, modern decor, wood floor, Sweet Bed, WIFI Internet, flat-screen TV with cable channels, and is entirely non-smoking. At the ibis hotel restaurant, you can enjoy à la carte service with quick and tasty dishes in comfortable and cozy surroundings, as well as savoring a good wine and delicious desserts. 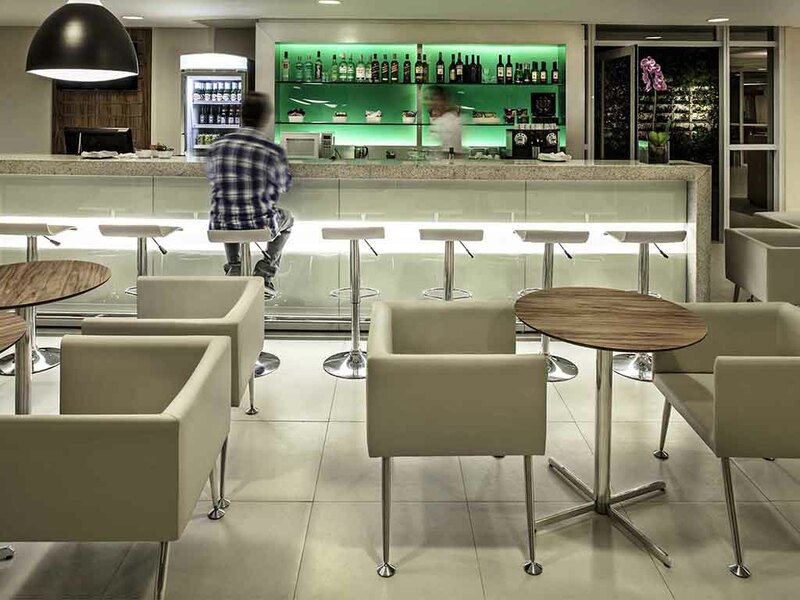 The relaxed atmosphere in the bar at the ibis Rio de Janeiro Parque Olímpico hotel makes it the perfect place to enjoy a good cocktail and a quick snack, or even sit down to a small business meeting with a delicious hot coffee. The room had 2 problems, the AC and the sink were leaking on the floor, and I noticed the furniture were a little bit wear off on the edges. The bed looked like a mat, so uncomfortable as the pillows. I know this hotel is more economic, but it's too exaggerated, too economic! I do not recommend to stay more than 1 day, otherwise, you will be a terrible night and wake up with a lot of pain in the your back! Like the hotel but parking too expensive. i stayed at the hotel for one day. I did the checking online but when i arrived there, the place for accord club and web checking didn't have anyone to assist. I had to wait for almost half an hour to be attended. I am now silver at the club and i expected to be attended as soon as i arrived since the club line was empty. The parking lot doesn't offer the self parking. Most of the hotels does have options to park the car. There is a good relationship with Novotel and the restaurant is very good. The pool can be used for 30 reais rate. Since the arrival, everything was neat. The desk service was very receptive and able to deal with any problem that might show up. Right at the begining we were informed that our payment wouldn't have been processed by the credit card company, but that wouldn't be a problem because our reservation was still on hold. I liked that respect for the customer, because based on other hotel experiences I've had (not with Ibis), many hotels just cancel the guest's reservations in order to make room to someone whose payment had already been approved. I had a minor incident with my room's door. It discharged, so I went to the desk service to get it fixed and they solved the problem quite rapidly. The room was clean, tidy and perfect for the few hours I stayed in the hotel room. The breakfast was delicious and the staff really helpful and friendly. Front desk was very slow and disorganized at check in. I made this reservation on Booking.com. On the check-in i didn’t got all the informations that i needed to know about the hotel. The room was nice due to the price paid and i just missed a place to charge my phone near the bed, due to the wake up call. Ibis delivers exactly what you expect for the price you are you are paying. Nothing more, nothing less. I liked the Hotel but I think inside the building needs to be less worm, more specifically on the corridor next the rooms, because the temperature was pretty hot. And my last suggestion is in all rooms should have mineral water free. Gluten free options in the restaurant and at breakfast limited, otherwise everything else was very good. It was OK. Some of the man power are extremely helpful while other are not that much. It may be due to language barrier. Hotel is dirty, the staff forgot my wake up call and due to that I lost my appointment. Nice neat rooms. Extremely cordial staff, had a great experience. The hotel was fine; the food was mediocre, the rooms were clean, but lacked many amenities -- only bath towels (no hand towels or washcloths), only 2 towels provided for two guests, there was no garbage receptacle in the room so one had to go into the bathroom to throw anything away. The shower was good. Staff were very nice and did their best to be helpful, but most had limited English. Dear Ms Ann Marian Thanks for taking the time to share your feedback. Your opinion is very important to us so that we can seek the continuous improvement of our infrastructure, service. We hope to see you again very soon in our hotel! Regards, Pâmela Melo Ibis RJ Parque Olimpico. I liked the price, but the service was lacking. There was not a certainty in the team about lunchtime on holydays, specially if they fall on mondays. I had a professional meeting, and asked if I could have lunche sooner. But people kept telling me different things, and I finally could lunch on the time that it was supposed to - thankfully, it was resolved. I thought the &quot;buy yourself at the reception&quot; kind of thing exhausting. If I had forgot to take water to the room, I had to go downstairs at 1h00 in the night and grab me some.